Over the past few weeks, I’ve focused my analysis primarily on Series A deals to explore the top of the funnel for the lifecycle of startup investment by institutional venture capital firms. We’ve investigated signals like the impact of team size on Series A candidacy, identified Khosla Ventures as the most active Series A investor of 2014 and even predicted 20 Series A candidates for 2015 who the data suggests are poised to raise their next rounds soon. Next up, I’m beginning my exploration of Series B activity. As with my other analyses I am excluding pharmaceutical, biotechnology, energy and clean technology startups because they tend to raise larger rounds at different intervals that can skew the more “pure” Internet tech investment trends. I look forward to covering these sectors in future posts of their own. 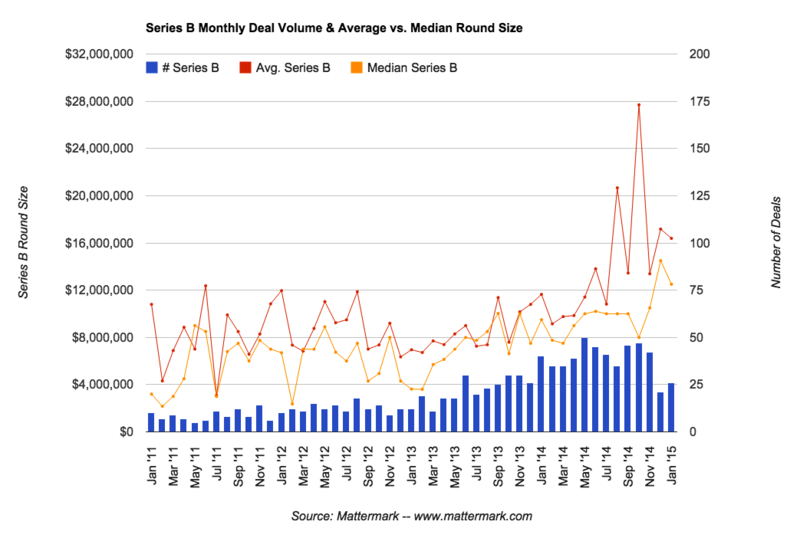 As you can see from the graph above, Series B deal activity has climbed since early 2013 and monthly volumes stabilized at about 2x their pre 2013 levels before dropping off in December 2014 and January 2015 (which is still incomplete). 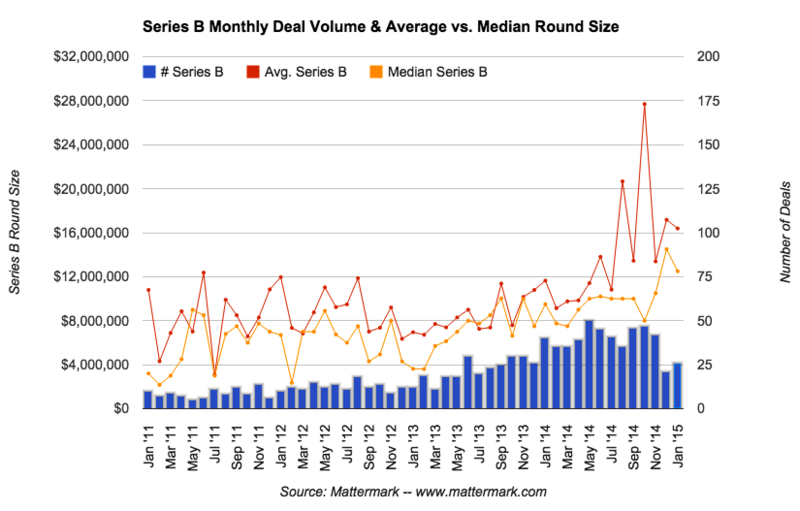 Interestingly, both average and median round sizes have remained higher and this has me wondering: if Series A is the new Series B, is Series B the new Series C? Stripping out the jargon, are much larger syndicated “seed” rounds that look a lot more like Series As having an impact further down the venture capital funnel? I look forward to investigating Series B trends further. Feel free to tweet to me at @DanielleMorrill on Twitter with ideas and questions you’d like to see us answer through data!